There’s an awesome article on the Internet, React.js Introduction For People Who Know Just Enough jQuery To Get By. After reading it, you may really see the power of React. If you are writing your websites with jQuery, you might consider either Angular, Ember, Backbone or one of the other more or less known front-end frameworks. This will make your development easier. But let’s take a look at React. With React you can easily split your project into small independent pieces, called components. Say, for example, you have a complex webpage. You might then have a layout, styled so as to support different themes, so it does not depend strictly on partials’ positioning and styling. And a bunch of partials, being rendered within that layout. Then you might split each of all those partials into reusable components, so you can compose your pages by simply placing each component on its place. So let’s try it out and create our first React component! It’s always great to have a typical structure for a project so anyone new to the project will not get lost. In some cases, as with this article, we may need to compile some resources. 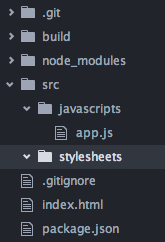 For that purpose we may create something like a build directory, where the compiled JS and CSS files will be placed. And define the build command in the package.json file, within the scripts section, so we may build our project running npm build or something very similar. But if you don’t want to type all those tags manually, there’s a great solution for you: Emmet. With Emmet you may just type html:5 and press Tab in your favourite text editor (I feel comfortable with both Sublime and Atom, but you can run Emacs or Vim and still use Emmet) and all the code will be generated auto-magically! Now, let’s add bootstrap and react scripts to our project. The best way of doing this is using Bower. There are two ways of adding dependencies with Bower: manually editing bower.json file or using the command-line. If you decided to manually edit the bower.json file, remember to set precise versions for each dependency. Otherwise, you may face the situation when someone installs your project and uses newer versions of the libraries, which are incompatible with the code that uses them (for example, some functionality disappeared or argument list for some function was changed). I preferred the CLI way as it chooses the correct library versions automatically and is really faster operation. This may be useful later, when building and deploying a project. Here I used the local version of Bower in the script, so as not to make another project requirement of Bower being installed globally. The same approach is used in this article for the building task. Global dependencies are not a great solution, because they require other developers, who install your project, to install tools globally, what possibly can break the tools installed on their machines already. Note: you may not use the <TweetBox /> tag from within the HTML. will not replace the whole state with the text field only. Instead, it will modify the text field only and leave maxLength unchanged. But when can we call changeState()? In Angular this is done with data binding. But in React we have events. Yes-yes, simple DOM events! Everything looks great with Riot: its size is much lower than React’s; it has ES6 and nice syntax; it does not turn your JS code into a substance on the edge of two worlds – the view layer and the logic layer; it even has scoped CSS!.. But Riot has one huge drawback: XHTTPRequest. By default, you can define your components inline, just within your layout page. But as long as it is a mix of HTML and JS, the browser will not correctly respond to your page, throwing strange exceptions . So, you may decide to extract your components into separate files. But here you might face the fact that most modern browsers do not allow asynchronous requests to files without the protocol being provided (so you can not load project files via AJAX while testing the project locally). And that’s how Riot loads your components – via AJAX. So you either need to pre-compile your components or run your project on a web server. Great news for each and every AngularJS fan: the essence of future of web development, Angular.js 2.0 is coming! It is built with TypeScript, which is even more powerful than ES6! It provides developers with a component architecture – HTML and JS encapsulation, but in an even more sophisticated form! Here, as you can see, data binding is being used, so there is no more need for event handling. And you can use all the power of TypeScript. You might’ve noticed the annotation, import statement, the FORM_DIRECTIVES constant, the templateUrl property and ES6-style class we used. Yes, these are features, provided by TypeScript. The @Component directive tells Angular to define our component. selector attribute defines the name of our new HTML5 tag, which will be used for our component. directives attribute is a draft drawback (in my opinion), telling which directives will be used by template. And the templateUrl attribute tells Angular, where to find the template for our component. Now, the template. It is not that simple as for Angular 1.x. We need to use a <textarea> tag in our template to capture user input. Here Angular2 proposes two options: the temporary variable, defined as our textarea’s attribute #var_name and the NgModel directive. Temporary variable is not what we are looking for, because it binds our variable to a HTML element itself. So in order to get its value, we will need to use either .value or .innerHtml property. And that is not that accurate, as with NgModel. And that’s why we were made to add directives parameter to the @Component annotation, to permit all the form directives being used in our template. But we can live with it, can’t we? So now our sample is complete and you may run it. Remember, we installed one more dependency, we did not talk about? Yes, the live-server! This is a great tool for developers – it allows one to run server once and just write the code. When the code changes, server detects that change and automatically reloads the sources and refreshes the browser. Cool, huh? To use this nice tool, you only need to navigate to the directory the index.html file lays and run live-server command (in case of global installation – the -g option for npm install; if you did not specify this – you may run the live-server with ./node_modules/live-server/live-server.js). Yes! That easy! Looking at these three libraries, I can say that it is definitely Riot which made my day. It is as simple as it is powerful and small. It lacks two-way data binding, but makes much more sense than React. And yet it does not require you to go mad installing all those dependencies to make it work. Moreover, if you combine Riot with WebComponents (or Polymer), you may end up building totally standalone, reusable web page components. And then making a new website will look like constructing a toy with Lego.